I'm standing on the beach at Nehalem Bay State Park. The ocean is dark grey and the wind coming over the water is cold. The clouds are heavy and low; rain could come at any time. This is what the Oregon coast is like most of the year. It is not a soft, warm place for beach towels, bikinis, palm trees and coconut scented sunscreen. It is a hard cold place where ancient volcanic flows meet icy currents from northern places. The ocean is always dark and never warm. Beach grass at Nehalem Bay State Park, looking toward Nehalem Bay. We leave the beach and are heading back to Portland. After spending a weekend renting a house with some friends, I appreciated the break from routing but are looking forward to getting back to that routine with the baby. The weeks upcoming responsibilities have already started pulling our thoughts back to home. My wife and I are discussing the logistics for the next five days. Our minds have left the beach, and it's time for our bodies to follow. But the ocean is there, next to us, undeniable. And I know that under the impenetrable surface lives a bounty of creatures. These creatures are my connection to this place. The water is too cold to swim in. The cliffs are too steep to climb. But the seafood is there to be savored. We stop in Cannon Beach to get lunch on the way home. The town is cedar shingles and narrow streets. Now is the off-season and the day is rainy. There are no lines; parking is easy. Surprisingly, good seafood restaurants are hard to find on the Oregon coast. A generally slow economy combined with heavy dependence on tourism mean many places don't last a whole year. The ones that do survive are generally low priced and moderate quality. The harvest of the sea is captured and distributed to other places with stronger economies and stronger demand. We stop at Ecola Seafood for lunch. To our surprise we find a menu full of delicious ideas and a deli case stocked with fish and shellfish of all kinds--whole crab, salmon fillets, halibut steaks, shrimp cocktail, oysters. 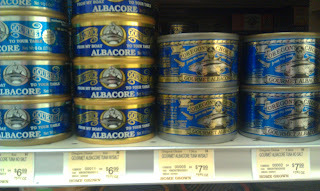 Stacked in front of the case is something I'd never seen before--locally caught Oregon tuna in cans. In The Essential Mediterranean, Nancy Harmon Jenkins says the fish balls recipe comes from a little Sicilian fishing port of Porticello and that Franco Crivello serves them like tiny meat balls, rolled no bigger than marbles, as an appetizer. The recipe is simple--make meat balls out of tuna and serve them with red sauce. In her recipe she uses tuna steaks, then grinds them like ground meat. Egg and bread crumbs hold things together just like a real meatball. But I don't have tuna steaks, and I don't have time to drive across town to Flying Fish Co. to get responsibly caught local tuna. Then I remember the cans. Canned tuna, while probably not as good as fresh tuna, would probably work just fine in a pinch. Luckily, I find some at New Season. 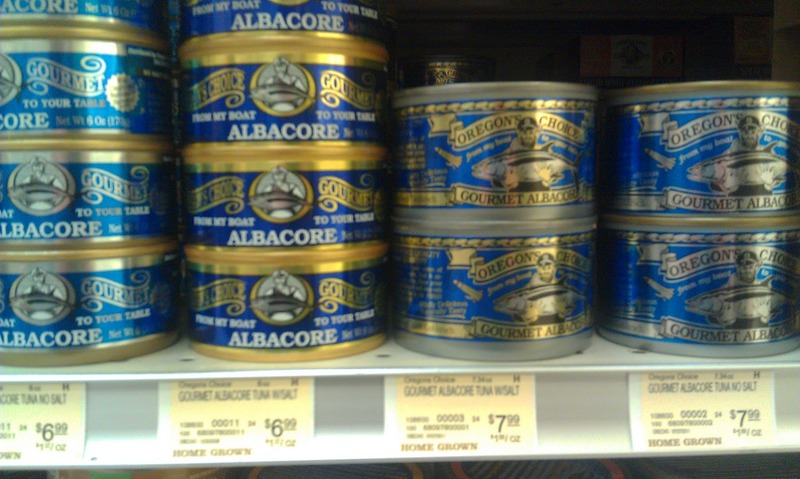 Whole sections of tuna in a can. 7 oz of loin steak for $7. Expensive. This is the sames as $17 per pound of fish. The pricing is not competitive, especially when Starkist is on the self below at a fraction of the cost. But it is the only option for line-caught, local tuna. And it is only half a mile from my house. It will have to do. The recipe is very simple, basically make little meat balls out of fish. If serving as an appetizer, make them marble sized. If serving as a main dish, make them ping-pong ball size. Make sure to add enough egg to get them to hold together. I had to add an extra half an egg. Mix everything together to your liking and form into balls. Saute the balls in vegetable oil until they are brown and the egg has set. For the sauce, make a simple red sauce. I don't like red sauce very much so mine is chunkier than they call for in the recipe. Saute the onions and garlic until soft, reduce the white wine, add tomatoes and spices. Done. How you serve this is up to you. I put it over rice for lack of imagination. Overall the recipe is good. I would add more spices to the fish balls next time, more salt at least. I left out the currants because I didn't have any and the pine nuts didn't really add much for me so they could stay out next time too. More cheese might be nice. And the sauce needs more complexity. But different and healthier than beef meat balls. A fun thing to experiment with. Good luck! Just remember to add some spice to perk it up otherwise it tastes like, well, tuna fish balls. In Rhode Island you could do lobster balls. Nice. I like to add garlic powder directly into the tuna mixture, it really brings out the flavor.